Window boxes, spilling over with summer colour, or containers lit up with seasonal bulbs – you can ring the changes by moving into the limelight pots of just-ready-to-bloom bulbs or plants at their peak of perfection. Still, it’s good to have a collection of containers which look good all year round in the garden. 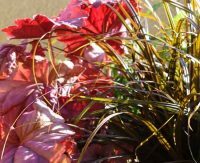 If you don’t have the time – or money – to keep updating displays, or if you just want some good do-ers to form a reliable backdrop to those flowering divas, then an all-season pot is the one to go for… And with a bit of thought and preparation, it’s not difficult to choose plants which will provide long-lasting interest in the garden.